[C.K.] 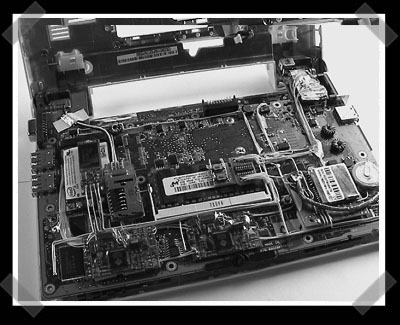 passed along this impressive writeup on modding an eeePC for just about everything you can think to add. This one’s got two four port USB hubs, internal GPS, bluetooth, 56k modem, FM audio transmitter, 4gb USB flash drive and a 801.11a/b/g/n card with a spare antenna for full 802.11n support. The wiring job looks excellent – very clean and well done. The only thing missing is a touchscreen. Nice mods, possibly the best documentation and pictures for any hack that I’ve ever seen. Yep i agree. It is pushing me to try some mod on my Compaq Mini. I will try external antenna and bluetooth. I agree with alecks, very nice hack and excellent documentation. and the ability to flip into tablet mode like the OLPC. Ok, here’s a link to add the touch screen. wait, so the EEE can run with no heatsink? it does in the video for adding the touchscreen.. or is there not a heatsink to begin with? I think it uses the keyboard for the heat sink. it’s awesome, but i’m surprised there’s no detriment to the USB functionality or GPS with that sort of wiring–looks neat, but definitely not controlled impedance and not electrically sound with higher-speed signals. The only reason I’m emphasizing this is that I recently tried to extend the USB connector for an internal flash reader I got with some simple braided wiring, and it just refused to work until I redid it with some real USB cabling. The distance of these connections in the laptop is shorter, and the spacing is just right, I guess. Is there any way to actually access the site posted? The google cache nor it work- they usually just time out. Now I am actually considering an Eee PC, especially with the touchscreen+other mods. I also worry about cross talk and signal loss in those wires. this is why i got me an eee. now alls i gotta do is save up to get all the goodies. The USB signals are differential so there isn’t really any trouble with cross talk between the pairs. the real thing you have to watch out for with USB is external EMI or RFI. Since the entire case of the laptop acts like a shield, it cuts most of the interference down to negligible levels. The layout is incredibly neat. Very methodical. Very Clean. Makes me want one. very nice workmanship on that! It will be fine if someone makes a torrent of this which is linked off a thinner version of the front page. It certainly counts as a ‘heavy page’ as it is. The laptop itself seems tolerable to use if one made several big virtual displays of it. The (mere 500:1 if I’m perceiving it right) contrast ratio kind of kills it as a pdf reader or other overliteral replacement for a ton of proper print. Very nice, I’m getting one of these very soon, and you have just done many of the things I was thinking of. Ever since I see the tear downs that show the extra usb port I was thinking “You could add any Small USB device to the inside” and you have done an excellent job. wellsfrago is wrong. Wrong. The 2G surf is an identical motherboard, but without the cover to change the ram, if you are taking the cover off anyway, then just change the RAM while you are in there. I like the idea for the switch to turn the devices on or off but what about making a software controller? Nothing complex, just over serial and it could be mounted where the current switch is in the expansion bay. followed by reason 4 on http://www.pocketables.net/2008/02/10-reasons-not.html. Which makes me assume that there are 2 version of the 2G, can anyone tell me how to tell which one has the soldered ram and which has an upgraded slot? amazing..What else can it do?